I hope that something in my writing, my plays, do that.I’m offering a post on a Tuesday. I know, not my usual style, but I have some things to share. 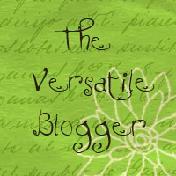 First, the Versatile Blogger award from Jade at Blush of Dawn. Second, I am a guest writer at Clara’s blog on living into your authentic self. This bright and beautiful sunflower is here to cheer you up. Here in Minnesota we’re getting a whipping from Mother Nature. She’s sending down sleet and snow and a nasty bought of weather. Go read my “Authentic Woman” post at Clara’s and think about what warms you up and makes you shine! I have a third thing: If you’ll look to the right, I have the 2011 Scriptfrenzy badge up. Yep, I’m doing it again. I can’t decide where to start. I have THREE ideas brewing. Choir Loft Confessions, Kitchen Table Confessions, and Piano Bench Confessions. April 1, I’ll sit down at a local coffee shop and begin. I’ll let you know then which one brings the cream to the top of my creative coffee cup. Journaling Prompt: What warms you up on a cold day (phyically or spiritually)? When you’re feeling down in the dumps (because of nasty weather, the worlds’ crises, or your own), what lifts you up? IWSG July, 2015, Be the Tiger! Thanks for sharing your sunflower cheer. Hopefully the sleet will let up for you soon! Thanks for stopping by my blog and for your sweet comment on my published story. I love the flower photo. Heading to Clara’s blog to read your post. Also, I LOVE your “confessions” themes. Here for you all the way — go go go girl! Just read your post on Clara’s blog. Very inspiring. I wish I had your gift of dialogue. Bible verses warm me up and feed me deeply. Of course, the presence of loved ones does too. Sillier things: warm blankets, diet Pepsi, beauty in all its forms. A good book and a big cup of tea warms me up on a cold day. Music always lifts me up and the act of creating, either with words or art. Best of luck with Scriptfrenzy. Any of those titles sounds like fun! Thanks for being the first “authentic” to post at my blog. Your words shine!